Using the project estimates functionality in AccountSIght, users can easily and quickly create online estimates in order to put online bids or contracts to prospective clients and to win the projects by providing realistic estimates. Only after the estimate is approved by the prospect, the project work can be started and the estimate can be converted into invoice for future needs. 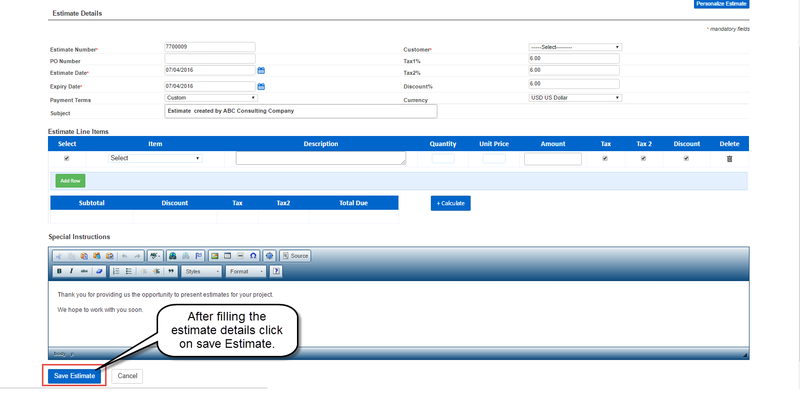 Before creating an estimate, user can configure the project estimates setting as required. Otherwise, a default setting will be used automatically. Only Admin can configure or create a project estimate. 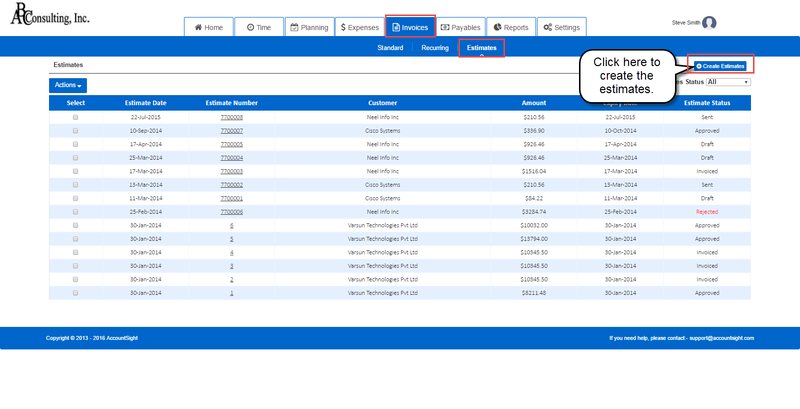 1] Login to AccountSight account as Admin and go to Invoices tab. 2] Within the Invoices tab, go to Estimates sub tab. 3] Click on the Create Estimates button. 4] Fill in the basic Estimate Details. Select the Customer. Select the product or service that you want to include in the estimate and other Estimate Line details. Click on Add Row to add a new product or service. Click on the Calculate button to find out the total amount. You can also put comments optionally in the Special Instruction field. 5] Click on Save Estimate to create the estimate.